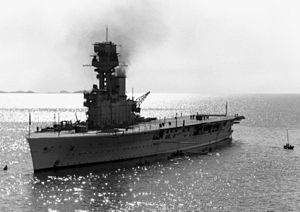 HMS Hermes vs French Richeliu: Perphas this episode of the Second World War is not well-known by many readers because it was difficult to think on a military engagement between English and French powers but it occurred. The main novelty of this post besides the interesting history is that it seems a new model kit at 1/700 scale from waterline series tries to reproduce the exact configuration of the HMS carrier Hermes when this event took place. The HMS Hermes was briefly assigned to the Home Fleet and conducted anti-submarine patrols in the Western Approaches when WW2 started. She was transferred to Dakar in October to cooperate with the French Navy in hunting down German commerce raiders and blockade runners. Aside from a brief refit, Hermes remained there until the fall of France and the establishment of Vichy France at the end of June 1940. Supported by several cruisers, the ship then blockaded Dakar and attempted to sink the French battleship Richelieu by exploding depth charges underneath her stern, as well as sending Fairey Swordfish torpedo bombers to attack her at night. While returning from this mission, Hermes rammed a British armed merchant cruiser in a storm and required several months of repairs in South Africa, then resumed patrolling for Axis shipping in the South Atlantic and the Indian Ocean.